QUANG NGAI, Vietnam, March 5, 2009 (AFP) - Nguyen Van Ha's temporary lodgings are no bigger than a prison cell, his bed consists of wooden planks balanced on a few broken bricks and there is no electricity or running water. Yet he and perhaps millions of others, experts say, have returned to this style of living in rural Vietnam rather than stay in urban centres Ho Chi Minh City or Hanoi, because the cities are too expensive and jobs are disappearing. "The economic difficulties in the world have affected Vietnam," said the gruff Ha, 28, as he smokes a cigarette on his day off from a wood-processing factory where he ekes out a living for his young family. "Many of my friends lost jobs in Ho Chi Minh City. They came back home and are still looking for proper jobs here," the father of a five-month-old baby told AFP in central Quang Ngai province, one of the poorest regions in Vietnam. "I think life will become more difficult this year. The price of everything has gone up so high, while jobs are more difficult to find," he said, adding he left Ho Chi Minh City, formerly Saigon, because of the increased costs. While inflation has settled down after rampant consumer price rises last year, food costs were still up 22.16 percent year-on-year in February, latest figures from Vietnam's General Statistics Office show. Ha said he and his wife now earn a total of three million dong (170 dollars) a month, just enough to live on and slightly more than the average monthly pay for workers at state-owned enterprises. He and a dozen others living in sparse rented shacks say that while the pay is more in Ho Chi Minh City, Vietnam's financial centre 850 kilometres (500 miles) to the south, they have less disposable income there. In the southern metropolis, a Louis Vuitton boutique sits close to the city's opera house, where foreign bankers sip cocktails on an outdoor patio, and Vietnam's first Porsche showroom recently opened for business. But for many in communist Vietnam, all that is a world away. Nguyen Van Minh, 47, who lets the shacks for 200,000 dong a month for two people, said there was an influx of workers coming back to the central province before Tet, or lunar new year, in late January. "Earning two million dong a month in Ho Chi Minh City is the same as earning a bit more than one million here because the living costs here are lower," he said, proudly surveying his moderate domain. "I have been in this business for about six or seven years but had never seen that many workers returning to Quang Ngai as before this Tet. "They came back because they were sacked in Ho Chi Minh City as companies went bankrupt, or they could not stand the high living costs there." 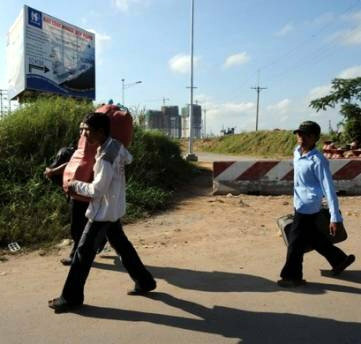 No official figures are available for how many workers have returned to their home provinces, but it is a trend which has been noted by the business community in Ho Chi Minh City and the capital Hanoi. It also echoes the situation, albeit on a smaller scale, in neighbouring China where migrant workers have been returning to the countryside in droves. "We did a survey and there were some who went back to their home provinces, but the ratio was not that big," said Lam Van Tiep, deputy head of Ho Chi Minh City's export processing zone authority, without providing figures. Tiep said a total of 240,000 workers were currently employed in the industrial zones dotted around the city, meaning 8,000 had lost their jobs since December, mainly at Japanese and South Korean firms. The global economic crisis was to blame, Tiep added, with Vietnam's economy cooling to 6.2 percent in 2008 after almost a decade of blistering growth that saw the country rapidly develop, dragging millions out of poverty. Jonathan Pincus, of the Fulbright Economics Teaching Programme in Vietnam, said it was impossible to pinpoint how many workers returned to the countryside because "the numbers range from a few thousand to millions depending on who you ask". "The loss of jobs in shoes and garments is certainly serious already," he added.